Right now, volleyball is a bit boring. Mostly, its just serving… because kiddo just moved up to the higher grade levels where the net is at full height and the serving line is in its standard position…. and so only about half of the girls can get their serves over the net with any regularity. Anyway, kiddo gets bored waiting for things to come flying her way, and has been messing with her pony tail holders and hair…. trying to fling the holder at the nearby girls… wrapping it around her wrists and trying to hit the ball like that… once even missing a ball that flew right in front of her because she was putting it back in her hair. So, in a random moment of “gee, wonder if this will work”, I decided to make her some hairbows to match her uniform…. thinking that maybe then she would leave the ponytail in and leave it alone. Because she’s all about accessories and nail polishes and having her ears pierced and all sorts of girly girl stuff that I was never really into as a tomboy. And so I made the bows. And she loved them. And several of the other girls complimented the bow she wore. And then, she decided to wear one of the bows to school on monday. Ok.. whatever. The bows make a few more appearances…. including one day that she’d put it in her bag and put it in herself because she was running late. So I decided to get colors that actually match her school uniform better, and did two more before I ran out of the white that I’d gotten for the volleyball/basketball uniform. So then a few days later, she mentioned another girl buying a bow at a local boutique store. And so then yesterday, she said that 6 or 7 of the girls have bows now. Her class only has 24 kids, so I’d estimate there’s only 11 other girls total. I’m more than a bit amused that I’ve managed to start a bow trend in the 4th grade now, totally unintentionally. I’m pretty sure that’s gotta be the first trend anywhere related to fashion that I’ve ever been associated with! lol! But now she’s started asking for specific color patterns… such as black with hot pink skulls. I’m hoping ribbon goes on sale soon… starting to get a bit scared of the cost of feeding the monster I’ve created. 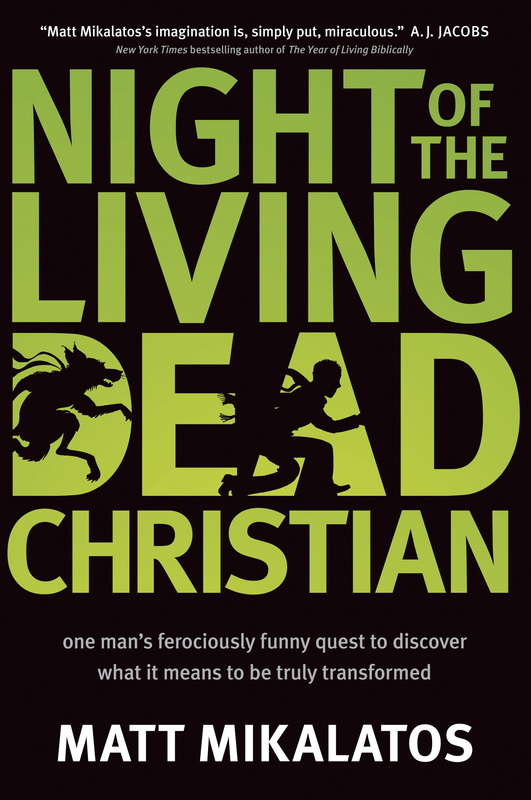 Like Imaginary Jesus, Night of the Living Dead Christian is again a book that is written mostly from the author’s perspective seemingly in reality and yet actually operating in an analogy. Sort of. It’s part funny book about vampires and werewolves, and part thought provoking book about Christians still struggling with their issues, and actually does this both at the same time. What the book was getting at was actually clearer in this book a lot quicker than the earlier book, where I spent a good bit trying to figure out what was going on, and seemed to get moving a lot smoother. The book is really well written and funny, one of those books you end up finding yourself still reading an hour after you thought you were just going to pick it up for a few minutes. The story moves well, even in the times when it’s essentially giving you background information. The monsters also aren’t exactly scary villains, most of the time anyway, so people who aren’t really into horror sorts of things will probably still be ok with this book… though I think I may have a few of these guys hiding in my closets. Those expecting the vampires to be sparkling and romantic may be a bit disappointed though. And the one thing that I have to warn you about… is to pay attention to chapter headings. I’ve discovered exactly how much I don’t… because at times some of the chapters will be notes from the werewolf, which baffled me for about half a page every time. It’s very clearly stated in the chapter heading…. the tone is completely different… about the only way they could have marked it as different any more would have been to change fonts or something for the clueless… and yet, I still kept missing it and wondering at the odd change of tone and perspective. So watch the headings. I keep forgetting why I know better than to try out the job fairs around here when there’s so many aircraft workers laid off around here. The ads always seem so wonderful… 100’s of booths! People interviewing on the spot! Bring lots of resumes and dress to impress! At least half of the booths will be for schools… some of them legit colleges… some of them much closer to scams. Then at least 3 different branches of the military. And then there’s my least favorites… the “looks like a job but not one that really pays” category. There’s always lots of these. Sell prepaid legal services (to your own friends and contacts)! Sell candles (to your own friends and contacts)! Sell greeting cards (to your own friends and contacts)! Sell avon (to your own friends and contacts)! Be a weight loss coach aka sell questionable health products (to your own friends and contacts)! Sell these amazingly wonderful knives (to your own friends and contacts)! I feel fairly confident in saying that nobody who goes to these booths will be able to pay their bills using these jobs. Sometimes there are a few that are borderline with that group… things that are commission only sales, but at least not expecting you to come up with all of your customers on your own. Given that I’m not really a persuasive type person who does well in pressuring people, to me these also seem unlikely to pay the bills. And there is always a section of booths that aren’t ever from around here. A state or two or three away… they are looking for people to move. They especially tend to be after the former aircraft workers or other engineering sorts of types… things usually above my head. To be fair, there usually are a handful of regular, normal, standard jobs… though much much fewer than anything you’d expect, and mostly close to minimum wage. At the last one here, I got three aps put it…. one for a fast food place, one for a grocery store cashier, and one for a gas station clerk. There was a fourth one that would have been appropriate for me, a security company, but i’d actually already applied to that one online a few weeks ago for working with their dispatch and hadn’t heard back. But it just always annoys me a bit how much these fairs seem much more like junk and cheap advertising for people aiming to go after the job seekers… and not actually aimed at getting them jobs. The schools… the junk jobs… even the military really… probably get a ton more people looking at them for cheaper than they would by putting their ads in other places. But it doesn’t really seem fair to the people who are looking for someone to hire them… not to be an easy marketing target. So it’s been a couple of weeks since I’ve been on my feet all day. And the plantar fasciitis is still flared up some… especially first thing in the morning… even with the extra rest and not being provoked every day. This really doesn’t look positive for on my feet jobs. Though, I’m not ruling them out yet… hoping that getting some of the high quality arch supports, or maybe even having to go for the prescription shoe inserts, might have some possibility. But it still strikes me on how much physical blocks are in place on my capabilities for a lot of jobs. Some are a bit more obvious and preventable, like being too fat to pass military tests and the like. Those i get… and am mostly ok with. But the wrist tendonitis…. and now the fairly similar issues with feet… keep frustrating me. I see these call center jobs. And I know they would hire me… call centers tend to have high turnover, and I have multiple years of experience. But I know… that I’d be absolutely miserable and in pain for the entire duration of the job, and risk doing greater damage to my wrists and the nerves. I pushed it further than I should have with my last non-seasonal one. And to reinforce this… my wrists have been acting up even with the extended amount of typing and writing I’ve been doing putting in applications. So I know better… but its still so tempting… and so frustrating that I know that I can’t do something I should be able to do, and through no fault of my personal choices. So no extended typing, and now possibly no constantly on my feet….. do you know exactly how many jobs that would quickly eliminate? Most of them that I’m qualified for anyway. I’m sure I’ve babbled about this before…. but one of the weirdest things to me about job hunting is how vastly different the possible outcomes seem. Each ad seems like a different door… leading to an entirely different path than the others… and ending up with an entirely different outcome and future. Now, some of it isn’t all that dramatic… i mean, the difference between two different restaurants would still end up with similar jobs. But still have completely different people to be met, coworkers to work with, and the different influences from there. But it’s just interesting to wonder… will I be a factory worker at a honey processing plant? process soybeans for a wage thats almost double what be last job paid? be a front desk clerk at a hotel? a person who prints out custom print jobs? an office worker for the county? work at a paint counter? cashier at a hardware store? work in the christmas section of a department store? restock shelves at a craft store? check in patients at an after hours clinic? All of the above are actually things I’ve filled out apps for in the last few weeks, as vastly different as some of them are. At earlier points in my life, I felt like I had control over the outcomes…. but right now, with so much depending just on who calls me back, it feels really random. Not so much of an out of control feeling… but just a wondering what’s in store and feeling like it could be anything anymore. God’s Love Letters to You is a 40 day devotional by Larry Crabb, and the latest book that I’ve received from Thomas Nelson for reviewing it. It says that it’s actually based on another of his books called 66 Love Letters, however, I haven’t read that book, so it was new to me, and I can’t really say anything on comparison. Each devotional takes lists a particular book of the bible, and has a verse from it, and then has a short passage written from the perspective of God as to ways that his love is shown through that book, in the form of a note from him. It then has a few questions to think about, and a prompt to start you off in prayer. These are a quick read, shorter than I had expected… probably about 5 minutes for most people depending how much time you spend on the questions. A lot of them were really interesting though… ways that I really hadn’t looked at different happenings as ways he was showing his love. 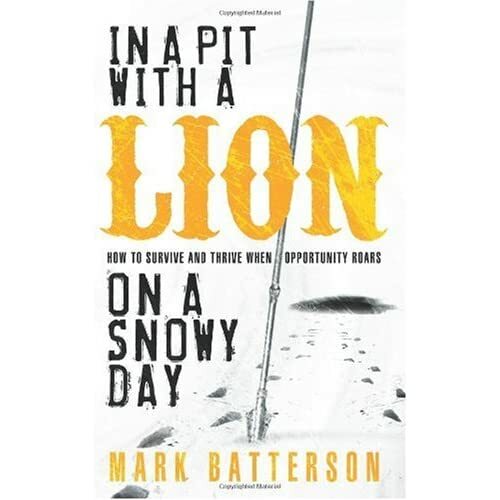 In A Pit With A Lion On A Snowy Day by Mark Batterson is the latest book I’ve received from Waterbrook Multnoma for reviewing it, and really ought to get some sort of prize for most interesting title. The book does sort of assume more into this passage at times… but makes some good points that sometimes things that are opportunities to build us for the future seem like scary lions at the time, but that often the life of truly following God is going to involve some things that seem scary and crazy if you were to look at them purely from a logical perspective. It’s a good reminder that things aren’t always supposed to be safe and comfortable, and that sometimes the reason for dealing with a lion now is to prepare us for being the king’s bodyguard a bit down the road.